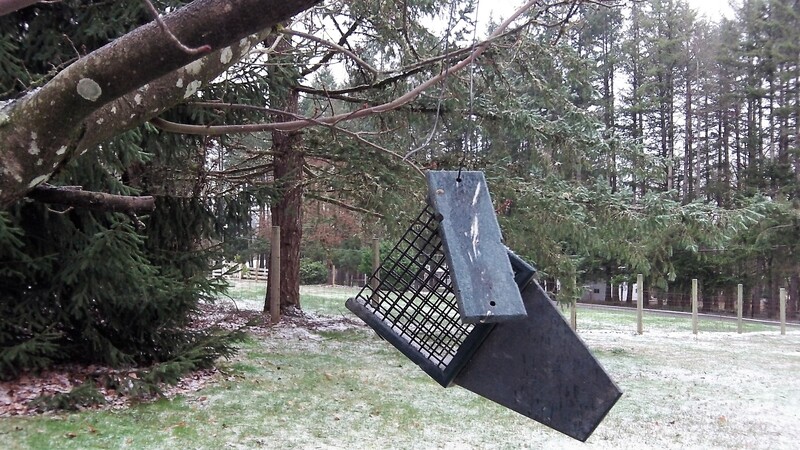 One wire holding feeder is cut and the suet is gone. Some kind of vandalism is easy to excuse. When, for instance, you’re a squirrel — perhaps, allegedly — and there, in a tree, you find some suet to still your hunger during a night of ice and snow. The mystery is how our presumed furry friend managed to cut through the heavy wire that secured one side of the feeder to the branch above. Makes you wonder about how well our other installations and man-made artifacts would be able to survive if they attracted the attention of a determined rodent with strong teeth. Or maybe it wasn’t a squirrel that needed a nighttime meal. Come to think of it, raccoons have made their presence felt around here. 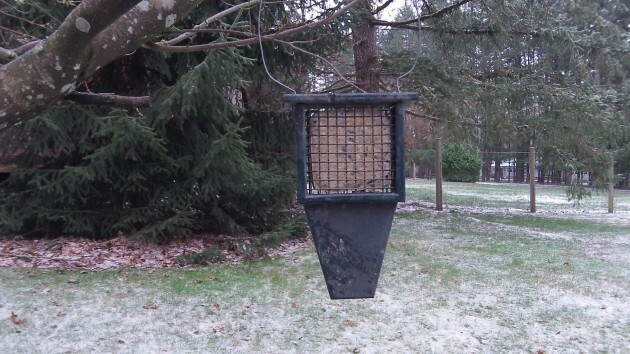 And they’ve been known to bend the wire that held down the feeder’s lid in order to get the suet out. So the other theory of the case is that one of the raccoons bent the wire back and forth until that it snapped. On the other hand, I’ve tried that myself when no tool was at hand, and I couldn’t get the wire apart. Discard that hypothesis. Repairs have been made and the feeder has been refilled. Ahhh — But has the frame/wiring been strengthened in any way? “The game is afoot, Watson.” View the trailcam images and we will name the perpetrator.